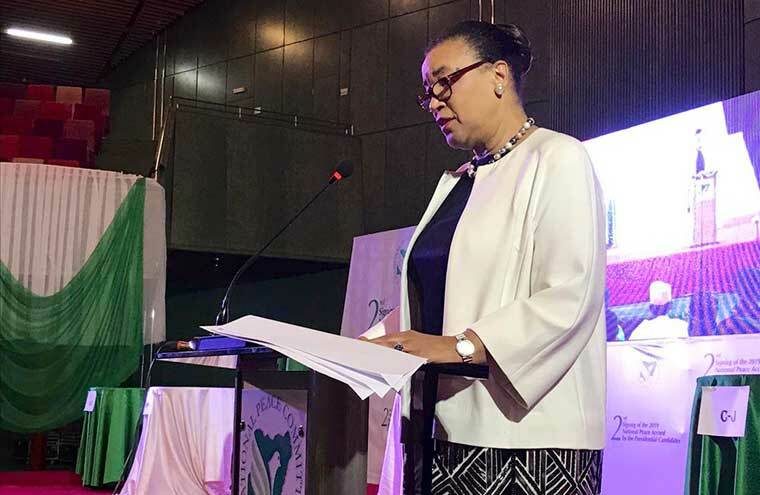 Commonwealth Secretary-General, Patricia Scotland, said on Wednesday that the strength of Africa depended on a “healthy” Nigeria. She said this was the reason the organisation was elated over the decision of candidates taking part in this year’s general elections to sign a peace accord to guarantee a peaceful and fair contest. Scotland met with President Muhammadu Buhari at the Presidential Villa soon after she witnessed the signing of the peace accord by Buhari, Peoples Democratic Party presidential candidate, Alhaji Atiku Abubakar, and other contestants. The signing of the accord had taken place at the Abuja International Conference Centre. She said Nigeria “is a treasured member of the Commonwealth family” where things must not be allowed to go wrong because of the wider implications for the rest of Africa. According to a statement by Presidential spokesman, Femi Adesina, Scotland praised Buhari for his “calmness and good humour” in spite of the pressure of the February 16 poll. Scotland also commended the Buhari administration for “the energetic way” it had addressed insecurity and its anti-corruption crusade so far, adding that the Commonwealth was always ready to assist Nigeria. Buhari had reassured Scotland that this year’s polls would be free, fair and credible. He noted that people would always have confidence in a government that they voted into power through a democratic process than the one which forced itself on them. The President added that a united Nigeria was not negotiable, recalling how the Nigerian Civil War led to needless loss of lives.